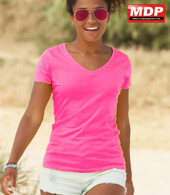 Ladyfit v-neck t-shirts from Fruit Of The Loom with new fit, longer body length and flattering neckline. Feminine fit with shaped side seams. 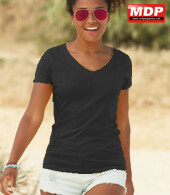 Cotton / Lycra rib v-neck with self fabric back neck tape. 100% cotton (heather grey 97%)165gm colours, 160gm white. 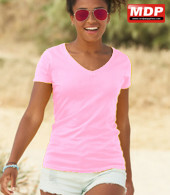 Pack pricing for LF V-Neck T-Shirts is for 12 garments in the same colour and size.